ROMULUS, MI (July 21, 2015) – Globally, the number of single serve hot beverage containers (often referred to as pods) create waste equivalent to disposing of 60,000 Hummer H2 vehicles every year (or 30 billion pods per year). In the U.S. along, 9 billion pods are making their way into landfills every year, and that number is growing. 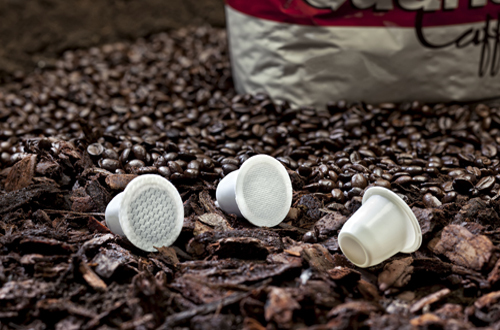 Now, through U.S. representatives of a major European firm, American companies who manufacture, sell, fill or market single serve capsules for hot beverages are invited to test and purchase samples of the bioplastic compounds or pods that are 100% biodegradable and compostable. Company officials note that the products made with these compounds have quickly taken over European markets and have just begun being marketed in the U.S.
• Proven in use, selling well in Europe; now starting in U.S.
For more details on the 100% biodegradable and compostable since serve cups for hot beverages.